In April 1952 Professor Guido Pontecorvo (1907-1999), a pioneer in fungal genetics, paid 20 shillings to the lending library, his wife Leni had her hair done for 6s 6d and their daughter, Lisa, got a new pair of sandals. 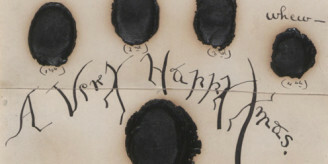 I know this because in among the digitised material that has recently gone online are the Pontecorvo household accounts. As long as you have registered as a library member, and have your log in details to hand, you can read these records now. Alternatively you could visit the Pontecorvo archive which is held by the University of Glasgow’s Archive Service to see the originals. 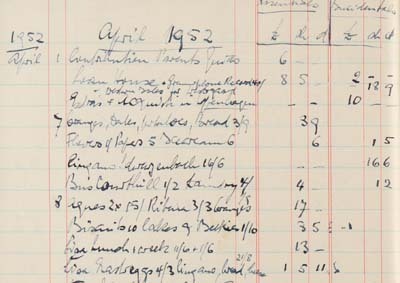 The Pontecorvo household account books start in April 1941 and cover more than 50 years. The last book ends in June 1993. An extract from April 1952 showing a payment to his parents and purchases of oranges, bread, cakes. UGC198/9/2/2/3. One of the best things about working on the digitisation project has been developing a sense of the scientists as people. I’ve been working with external organisations who have been digitising archives and the collections have been new to me so there has been a lot to discover. Some archives give away more than others. 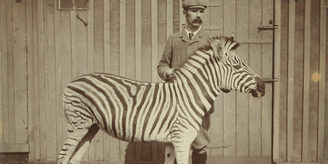 It is possible to get an impression of someone from an archive of strictly scientific records but the best ones (from my point of view) are the ones that include more clues about the scientist’s personality and lifestyle. Ponte’s archive is very forthcoming, not only do household accounts show how he spent his money there are plenty of photographs revealing his passion for walking in the mountains looking for alpine plants and hundreds of letters (in English and Italian) showing what a highly sociable networker he was. His visitors book includes the names of scientists, for example Ruth Sanger and Francis Crick, alongside family and friends who visited him in Glasgow. 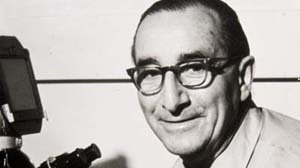 His biggest contribution to genetics probably relates to his work on the fungus aspergillus nidulas, specifically the discovery of asexual reproduction in fungi and the idea that genes were functional unit. The first page of his notes for a lecture he gave in 1964 is below. The rest of his notes for this lecture on the ‘Genetics of Aspergillus’ can be seen on the library website. 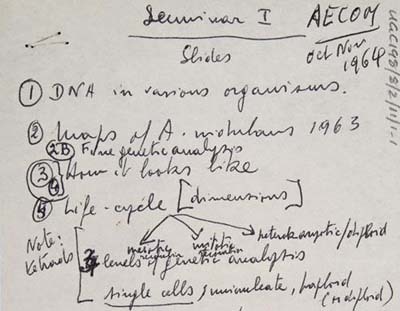 Pontecorvo’s notes for a lecture on the “Genetics of Aspergillus” given in 1964 at the Albert Einstein College of Medicine in the USA. UGC198/8/2/11/1.